Q: The US navy warships yesterday sailed through the Taiwan Strait. Does China consider this a provocative move by the United States? A: The Chinese side has been closely monitoring from start to end the passage by the US warships through the Taiwan Strait. We have expressed our concern to the US side. The Taiwan issue concerns the sovereignty and territorial integrity of China. It is the most important and sensitive issue amid China-US relations. We urge the US to observe the one-China principle and the stipulations of the three China-US joint communiqués and prudently and properly handle Taiwan-related issues so as to avoid undermining China-US relations and the peace and stability across the Taiwan Strait. Q: According to reports, on October 22, the ROK Defense Ministry said that the ROK and the DPRK confirmed the completion of the de-mining operations in the Joint Security Area. They agreed to take measures of withdrawing military posts, armed forces and firearms by October 25 and will conduct a joint verification for the following two days. In accordance with the agreement on military affairs under the Panmunjom Declaration, starting from November 1, the DPRK will close coastal artillery guns deployed in the west coast and completely stop firing onto the buffer zones. What is your comment? A: We have noted relevant reports. We welcome and commend these positive efforts and latest achievements as the DPRK and the ROK work to implement the Panmunjom Declaration and the September 19 Pyongyang Joint Declaration. People on the Peninsula and in the region have all been longing for peace, prosperity, reconciliation and cooperation. As a close neighbor to the Korean Peninsula, China firmly supports the DPRK and the ROK in translating their leaders' consensus into concrete actions, consolidating political mutual trust, and moving forward the process of reconciliation and cooperation on the Korean Peninsula. We hope that the DPRK and the ROK could follow through on their agreements reached in the relevant declarations, continuously push forward DPRK-ROK interactions and cooperation, and play a positive role in politically resolving the Peninsula issue and realizing enduring peace for the region. Q: It is learnt that the 16th Senior Officials' Meeting (SOM) on the Implementation of the DOC will soon be held. Do you have more information on that? 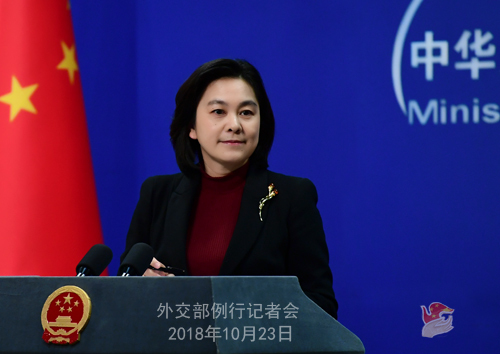 A: China and ASEAN countries will hold the 16th Senior Officials' Meeting (SOM) on the Implementation of the DOC in Manila, the Philippines on October 26. Senior diplomatic officials of China and ASEAN countries will attend the meeting. The 26th Joint Working Group (JWG) on the Implementation of the DOC will be convened back to back before that. China will have an in-depth exchange of views with ASEAN countries on the further implementation of the DOC, promoting maritime practical cooperation and the consultations on the COC. Q: Reports say that Japanese Prime Minister Shinzo Abe will be accompanied by about 500 Japanese business leaders during his upcoming visit to China this week. Does this mean that the two sides will achieve many outcomes in the economic and trade areas during this visit? A: Economic and trade cooperation is an important part of China-Japan relations. This year marks the 40th anniversary of the inking of the China-Japan Treaty of Peace and Friendship as well as China's reform and opening-up. During the past four decades, Japan's business community has taken an active part in China's reform and opening up and conducted economic, trade and investment cooperation with China, which has contributed to the respective development of our two countries as well as the growth of China-Japan ties and delivered tangible benefits to the two peoples. China boasts a huge consumer market of nearly 1.4 billion people. Now China is implementing new measures to expand the opening-up, which will provide China-Japan economic and trade cooperation with greater opportunities and broader prospects. When Premier Li Keqiang visited Japan in May this year, China and Japan reached a series of consensus on expanding investment and financial cooperation and conducting the third-market cooperation. During Prime Minister Shinzo Abe's visit to China this time, our two sides will hold the First China-Japan Third-Market Cooperation Forum and explore how to step up cooperation in such areas as high and new technology and finance. We believe that this visit will help elevate and upgrade our bilateral practical cooperation and make China-Japan ties continue to grow after our bilateral relations came back to the right track. 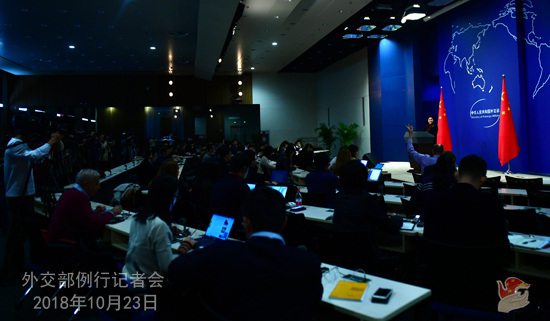 Q: On October 22, US President Donald Trump said that the US would withdraw from the Intermediate-Range Nuclear Forces Treaty and China should be included in the treaty. On the same day, US National Security Adviser John Bolton also said that the US is faced with a very real threat from China and it does not want to be the only country bound by the treaty. 33 to 50 percent of the overall number of China's ballistic missiles was out of line with the Intermediate-Range Nuclear Forces Treaty. What is your comment? 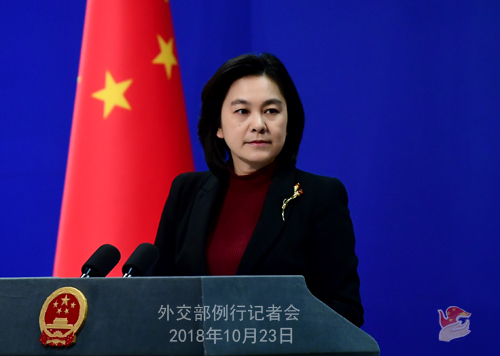 A: We have noted the relevant statements made by the US side on its announcement to unilaterally withdraw from the Intermediate-Range Nuclear Forces Treaty, which mentioned China many times. Yesterday I made clear China's position on this issue. The Intermediate-Range Nuclear Forces Treaty, which was signed by the United States and the former Soviet Union, is a bilateral treaty. Now it is the US that wants to unilaterally withdraw from the treaty, but it makes an issue out of other countries. Shifting blames to others does not make any sense. China pursues a national defense policy which is defensive in nature and firmly safeguards its legitimate national and security interests. We will by no means accept any form of blackmail. I once again urge the US to refrain from going against the trend of the times and think twice before taking any action on this issue. Q: It is reported that the Chinese and Japanese governments are negotiating an end to the 40-year-old Official Development Assistance (ODA) in hope of finding a new cooperation model. What is your comment? How do you comment on Japan's ODA to China? A: Japan's ODA cooperation with China has played a positive role in China's reform and opening-up and economic development. Japan has also reaped tangible benefits from such cooperation which constitutes an important part of the mutually beneficial and win-win cooperation between China and Japan. In light of the latest situation, China would like to remain in communication with Japan on the relevant dialogue and cooperation. Q: State Councilor and Minister of Public Security Zhao Kezhi is currently on a visit in New Delhi. He held talks with India's Home Minister Rajnath Singh yesterday. The two sides signed the cooperation agreement between the Ministry of Public Security of the People's Republic of China and the Ministry of Home Affairs of the Republic of India. How does China view the significance of this agreement? Can you provide more details about it? A: On October 22, China and India held the high-level meeting on law enforcement and security for the first time. State Councilor and Minister of Public Security Zhao Kezhi and India's Home Minister Rajnath Singh signed the cooperation agreement between the Ministry of Public Security of the People's Republic of China and the Ministry of Home Affairs of the Republic of India, which is of great importance to promoting the growth of bilateral ties and elevating our cooperation in law enforcement and security. Now China-India relations enjoy a sound momentum of growth. In April this year, President Xi Jinping and Prime Minister Modi held a successful informal meeting in Wuhan. Enhancing bilateral cooperation in such areas as law enforcement and security will certainly create a secure and stable environment for the common development and prosperity of our two countries. According to the readout that has been released, going forward, our two sides will focus on strengthening practical cooperation on counter-terrorism, combating separatist forces and cracking down on transnational crimes and jointly prevent and fight separatist forces and transnational crimes such as counterfeiting offenses, telecommunications fraud and drug crimes. Meanwhile, we will expand the communication channels and cooperation areas between our law enforcement departments and effectively protect the security of the projects, institutions and personnel on each other's territory. Q: Reports say that during the meeting, the Indian side sought China's support for Jaish-e-Mohammed (JeM)'s leader, Masood Azhar, to be designated as a terrorist at the UN. Reports also say that India has asked China not to give shelter to the United Liberation Front of Assam (ULFA)'s leader Paresh Baruah. Do you have any comment on this? A: Like I said just now, the readout on State Councilor and Minister of Public Security Zhao Kezhi's meeting with Indian Home Minister Rajnath Singh has already been released by the Chinese side. You can get a main picture of the meeting in the readout. As to whether the two specific issues you raised were talked about at the meeting, I am not aware of the relevant information for the moment. As for India asking for China's support at the UN to list Masood as a terrorist, we have reiterated our position many times. China always takes an active part in the international counter-terrorism cooperation, and meanwhile we will base our decisions on the merits of each case. We would like to strengthen counter-terrorism and security cooperation with India and jointly safeguard regional peace and security. You also mentioned that India asked China not to offer cover to the leader of the United Liberation Front of Assam on its territory. I want to stress that the Chinese government always adheres to the principle of non-interference in other countries' internal affairs. This position has not changed and will not change. The following question was raised after the press conference: Today the Japanese government held a commemoration to mark the 150th anniversary of the Meiji Restoration. Prime Minister Shinzo Abe attended and addressed the event. What is your comment? Hua Chunying: We have noted that the Japanese government held a commemoration to mark the 150th anniversary of the Meiji Restoration. The Chinese side hopes that the Japanese side can view that historical period in a correct and objective way, stay committed to the path of peaceful development and take concrete actions to promote the improvement and development of Japan's ties with its neighbors.